@matteumayo I have a theory what might be going on. Unity has the ability for programs to set compilation defines, which are useful to turn pieces of code on or off depending on platform, unity version, or in this case, if realtime-CSG is present or not. Unfortunately the way this has been implemented on Unity is a single string containing all user-defines. When this string is changed unity will recompile everything. I have a theory VRTK is overwriting these user-defines and removing the defines created by realtime-CSG, then realtime-CSG notices that they're missing and adds them back again. In between unity recompiles everything and this creates an infinite loop. There is something wrong with the freeform generator in 511.
matteumayo and dadude123 like this. Yin757860070 and dadude123 like this. Any idea what causes lines to sometimes flicker and become unselectable? "Could not create brush from given 2D shape"
Are there some restrictions on what 2D shapes are valid? Somehow I'm now unable to reproduce the "could not create brush" error. Got a crash two more times, but other than that and the line selection thing everything is working pretty well now. I know that crashes like that are really really hard to track down. But I'm hoping that eventually we'll find something that all those stack-traces have in common. Maybe a method that all of the methods call (at least the last ones we can see before the stack trace goes into "no file name or line number available" mode. If that doesn't help, or if you need different information, let me know! Thank you so much! Amazing support as always. Good news! I figured out a guaranteed way to reproduce an instant the crash. I recorded two videos of it. Do you think I should invest more time to also find a way to reproduce the crash that is related to "ApplyAnyChanges"? Or do you think that they're essentially the same bug? The edge selection is better as well! Do you think it is worth it if I invest some time to make a simple "hollow" and "repeat" modifier/brush component for my project? Or is the parametric modelling workflow that was mentioned a few pages back something that is coming relatively soon? Or if the basic API will change a lot in the near future, then I'll just wait until that has stabilized a bit. I will start on the parametric modeling workflow foundation 'soonish', right after the basic API has stablized yeah.. and I wouldn't try to use whats there right now because there's going to be a lot of changes .. I'm getting some holes in the geometry whenever there are cylinders/spheres inside some other brushes. Not sure if this has to do with some internal optimization, but creating a cube and a sphere and then moving them into each other (both addtive), then rotating them around a bit will cause this. Not as strong as it is in the video, but it's always there when you look around the "rim" where the sphere intersects the box. Video to show it off here, maybe how the holes are formed gives you some information? Let me know if it helps or what I can do to give you better information. Sometimes the gaps get pretty large when the model gets more complex. If it helps: When rotating an element (a sphere or cylinder) the gaps seem to "snap". So maybe its some kind of rounding error thing? Or some grid snapping? Maybe this is related to (1), or maybe there are two different things at play here. Freeform shapes + Intersection brushes have two types of holes. The first one is where there are simply some faces missing on the "wave" in the video. The second one is at the left and right end of the wave, it looks like there are some triangles cut out of the shape. Almost as if the top of the shape is smaller than the bottom, but since I drew it using the grid, that should be impossible. It feels like I'm getting less crashes with 513, but there are still some remaining. Here is a trace from the last crash. Maybe it helps that it shows how many functions there are are after the last method where the name is known. There is a bug where when you export to a unity model, the whole model just turns invisible. I haven't been able to create a reliable way to reproduce it yet, but I'm looking into it and will try to debug it tomorrow. 4. ok, well let me know if you find a pattern .. this is the first I've heard of it? 1) will do. I'll send you an email within the next hour! 2) The repro project I'll send you has the "wave" form as well, but it would be best if you draw it yourself as well (seeing as it is a pretty simple shape that has a variety of issues I mean). 3) Ok, I'll look into it and try to get a crash dump. I'm using 2017.3.0f3 and rcsg 513, but I'll also write that down when I send a crash dump. 4) I figured out that it 100% has something to do with culling. The mesh suddenly becomes visible in some cases and hides in other cases. Adjusting the pivot mode / recentering the pivot also changes things. Maybe the model bounds get calculated wrong so the model gets culled? But how is that even possible, isn't that 100% done inside Unity? 514 is not usable, you can't move any brush, it moves it really far away. Edit: also you still can not select all the brushes. If you have a few subtractive and additive brushes, some surfaces just dont register. In this video you should be able to select "Brush (1)", right? But you can't click through the subtractive brush by using selection-cyling /depth-clicking. No problem, don't worry about it!! Any programmer (well, semi-experienced at least) will completely understand! Refactoring can often be really troublesome to work with as it is. And when you want to publish other releases in the meantime its even worse. (And forward-porting fixed from an older branch isn't all that appealing either, I know, haha). - selecting edges while rotating (has slightly improved in some recent version, maybe 512 I think? ), but can be worked around easily by rotating the camera a bunch of times. As long as the brushes persist and there's no full breaking change, then everything else can be fixed later. That is mesh holes, unity model bounds, ... and crashes will likely be fixed through the refactoring as well. So no point really in working on any of that yet I guess. You mentioned in an earlier post that the foundations for parametric modelling will be layed out soon. Do you think now is a good time for us users to make a list of scenarios/features that we'd like to see in the future version? Edit: actually never mind about the depth clicking, as it is, I think it is pretty ok right now. 516 definitely fixed a problem where there were "phantom-planes" visible inside complex meshes. Cool! I'll prepare a list of modifiers I imagine, scenarios I'd use them in, etc. Hi, sorry for being so quiet this week I've been working hard refactoring all kinds of low level code to be able to make a good solid low level API for realtime-CSG that is easy to understand, use & is performant. dadude123 and matteumayo like this. Hey, this tool looks fantastic! I've been toying around with the eval version and it's a lot snappier and more stable than SabreCSG. It also seems more flexible in general. One thing I really love is the ability to quickly carve out spaces using complex brushes such as spheres. I could never get Sabre to do that without causing Unity to hang for forever ( and I know Sabre is open source now, so I could probably fix it myself, but I'd rather find a tool that just works right out of the box - the intent here is to save time, after all ). A few odd little things I've noticed that stand out: Texturing complex surfaces such as spheres and hemispheres feels a little unintuitive ( but then again I'm not an artist so I wouldn't know an intuitive way to texture spheres if it hit me in the head ). It's hard to get spheres/hemispheres to share the same number of "sides" ( or, edges at the equator ) as cylinders of the same radius. Most of the time they won't quite line up, so if you have a hemisphere sitting on top of a cylinder, there's usually lots of little seams that don't look quite right. Probably not a big problem once properly textured and lit in a "real" game environment, but that just stood out to me. Overall, RealtimeCSG looks like it could save me a lot of time in the long run. I look forward to exploring its capabilities in greater depth! @DragonRider thanks for the kind words! Are circular stairs part of that? So I guess I won't have to jump through hoops to get things like this anymore: (just a quick mockup) https://i.imgur.com/zeAauYw.jpg and stairs like that can be more rounded as well. Does that mean that the much easier cases will be possible as well? I'm thinking a rectangle, extruded, following a spline to easily make a circular ramp. possible work in other platform after publish ,with code only create and CSGMode.Subtract? possible work in other platform after bublish ,with code only create and CSGMode.Subtract? Do you mean doing CSG operations at runtime? That is not supported. This tool is editor only (for now, but there are plans to add a runtime mode eventually). You build your scene/model and then export it to a real model (Unity model, or .FBX). For the last week+ I've been working on refactoring the code and building a simpler, easy to use low level native API. I'm far along but It'll take a little while longer before it's in a state that I feel I can release that. I also have a couple of bug fixes in the pipeline. On top of this low level native API I can then more easily build the component based "generators". In the old way the generators would simply create hand editable brushes, in the new way, for example a cylinder created by a generator, will stay a cylinder and you can keep changing all the parameters for as long as you like. There will still be a way to convert these back into editable brushes like before, of course. By editting you mean "mesh editting"? So scaling will still work? So I guess clipping, moving edges/verticies, ... will only be possible for "commited" brushes. Will we be able to curve the created geometry from generators with splines without converting them to an edittable brush? Brush mesh editing, with which I mean modifying the shape of a brush, would only work with editable brushes. You'd still be able to move/rotate/scale them of course. Clipping on generated geometry would require realtime-CSG to 'remember' all the splits and re-apply them every time the geometry has changed .. which would get messy real quick. The generators would essentially behave like the generators that exist right now, but just that when you re-select your generated objects it still will be 'a generator'. Is there a way to snap a face to another face, or a vertice to another vertice without relying on the grid? @terrivellmann Not at the moment no .. so you're saying you need vertex snapping with brushes? It could be useful at times! Though I usually stick to the grid and that works out. I want to add support for "grid objects" at some point though, which should also help with this. You'd basically be able to set a default grid for certain groups of objects in the scene. RCSG has become my default tool for quickly creating some geometry for prototyping. Adam-Bailey and Petethegoat like this. Haha, I was going to inquire about it. Slightly disappointed they didn't go with realtime CSG instead, I think the CSG model can be a little less fiddly for level design, but a nice addition nonetheless. Hopefully their progrids integration will be generic/extensible enough that you'll be able to use it instead of maintaining your own grid implementation! hippocoder, Petethegoat, matteumayo and 1 other person like this. @dadude123 well I'm obviously not impartial here, I obviously think csg is a better technique for level design ;p especially when you want to do procedural stuff .. it's hard to procedurally create, for instance buildings, when you have no concept of solidity. I tested the demo and I'm really impressed, your asset is really awesome. You've got the best CSG algorythm on the asset store, I guess you don't use CSG.js like others. I know it has been ask before, but do you have plan and maybe an ETA for runtime support ? I should have a low level editor API to release soon, which will become the runtime API after a bit of real world testing. AFrisby and Ziboo like this. Another quick update, I'm at the point where I'm just writing tests and documentation. Hopefully it doesn't take too much time before I'm done with that. // First we create a BrushMesh, which describes the mesh for a brush. // For this version you'll still be required to feed it the old controlMesh format. // This array describes the types of meshes we want to generate ..
// Retrieve the kind of meshes that the tree can generate ..
// for instance, for a particular material if the vertex count is above 64k. // Realtime-CSG will then return multiple meshes for the same material. // CSG for this tree only. Also, during all the refactoring I optimized some pieces of realtime-CSG that improved performance by 50% on a heavy test scene of mine. Iterative changes (like moving brushes) are even more improved. Short version, for this scene CSG is done in under a second. It has 3879 brushes, in a complicated hierarchy where lots of brushes overlap. Flurgle, Petethegoat and matteumayo like this. 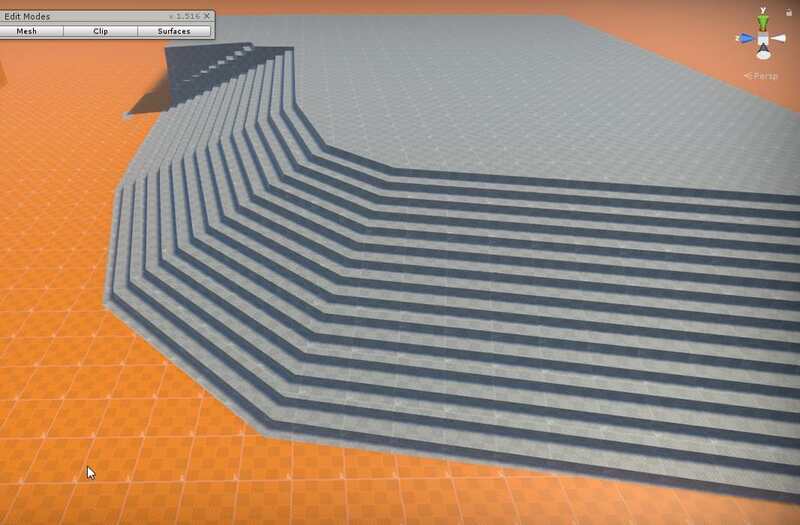 Are curved edges disabled in the demo? I had to create a curved arch by clipping a cylinder in half and make it subtractive. In the full version, can I just make a freehand square, then curve the top edge? First off, thanks for creating a great tool. I hope it, or at least some of its features, will be incorporated into Unity one day. Two questions: Can tool-tips be disabled? And I've nothing particular in mind when asking this (mostly curious), but would it be conceivable to add some kind of functionality that allows a developer to distribute/link to a game-specific, pared-down version of the plugin for modding?